The Sonar is the 23-foot internationally acclaimed one-design with a contoured, sit-in cockpit that is 11' 6" long and is self bailing. Angled seat backs and coamings are designed for comfort when heeled and recessed handholds offer extra security. The Sonar's sail plan is designed for efficiency and control with a full range of rig adjustments that allow the crew to easily alter sail shape to changing conditions. A generous keel and deep spade rudder provide excellent lateral stability and control and the Sonar can easily turn in its own length. The keel to hull joint is designed to minimize damage in an accidental grounding. 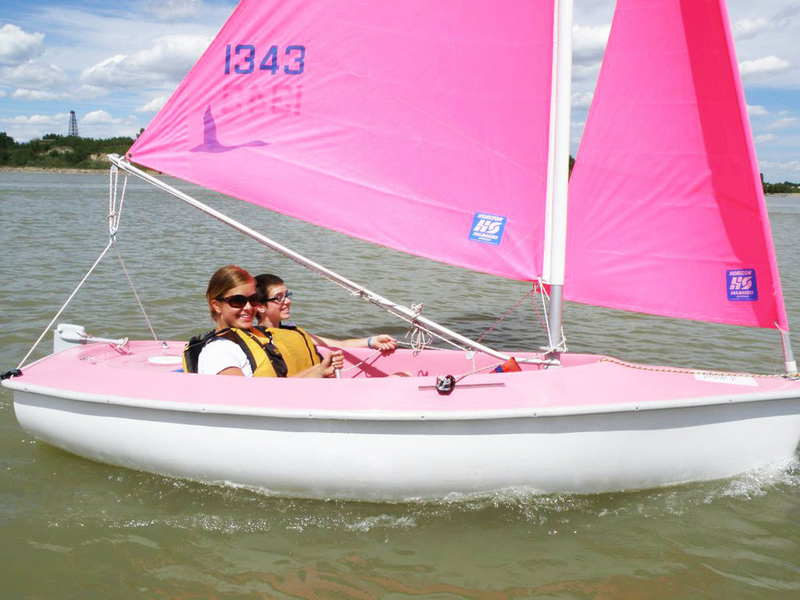 The Martin 16 sloop was specifically designed for children and adults with physical disabilities to easily maneuver the vessel on their own accord or using power assisted technology. The boat is 16-foot and has a 300lb, lead bulb attached to the keel of the boat which makes it impossible to capsize (tip over). In addition, the inner hull of the boat is filled with foam flotation that makes the boat unsinkable, even It if it totally floated. Once comfortably seated, the joystick tiller (to control the steering) and lines (to control the sails) are directly at hand making it possible to sail the boat independently without needing to change position. A second seat for an instructor or companion is located behind the sailor’s seat. For sailors whose disability makes accessing our boats safely difficult we have a hoist which can be fitted into the pontoon, and is a great way to securely and safely transfer sailors from the pontoon to the boats. Our hoist is suitable for sailors of all shapes and sizes and is operated by trained staff. You will soon be on the water and enjoying the freedom that sailing offers. Optional power-assist equipment can be added to the boat to allow individuals with weak arms to sail the boat using a joystick similar to those found on power wheelchairs. In addition, for those who cannot move their arms at all the sip ’n puff system allows them to sail the boat using their breath! Allowing the individual to sail the boat independently. 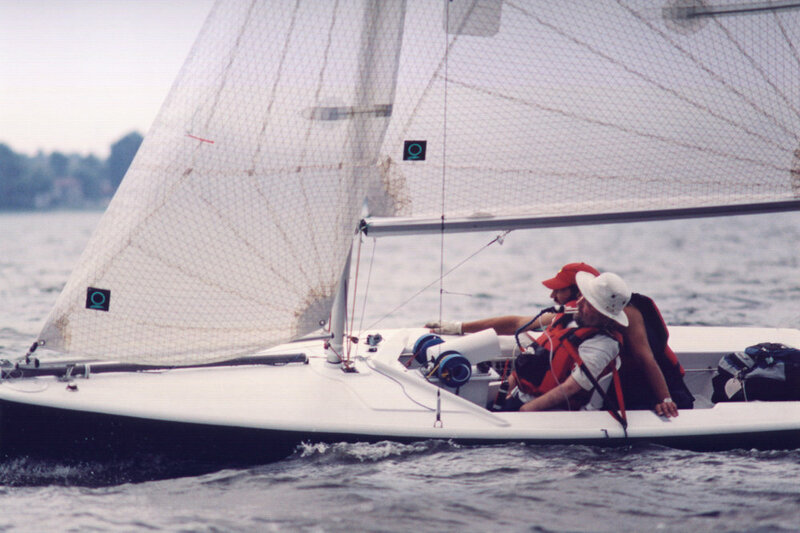 The Sip 'n' Puff system at the heart of the Martin 16 sailboat allows people with the highest-level disabilities to sail. A small sip or gentle puff of air is all that is required to activate this switch forward or reverse. The mechanism is completely enclosed within the machine. The mouthpiece ergonomically shaped to fit comfortably between the lips. The Sip n’ Puff is a term used to describe a dual-switch system which utilizes pneumatic switches. A single piece of tubing, accessible to the user, controls both switches. A slight pressure (puff) operates one switch, while a slight vacuum (sip) operates the other. All functions, including setting the sails and steering the boat, are controlled by the sailor’s breath. The term Sip 'n' Puff, is somewhat misleading. Implication is that the user must sip from the tube, or puff into the tube, much like drinking from a straw, or blowing up a balloon. In reality, the pneumatic switches are very sensitive. The switches are activated by a slight vacuum or a slight pressure. This is accomplished by creating this vacuum or pressure within the mouth. No actual sipping or puffing, to the degree normally thought of as 'sipping or puffing', is required. Unlike other control methods, sip 'n' puff control keeps conductive material away from the user. This eliminates the possibility of electrical shock. 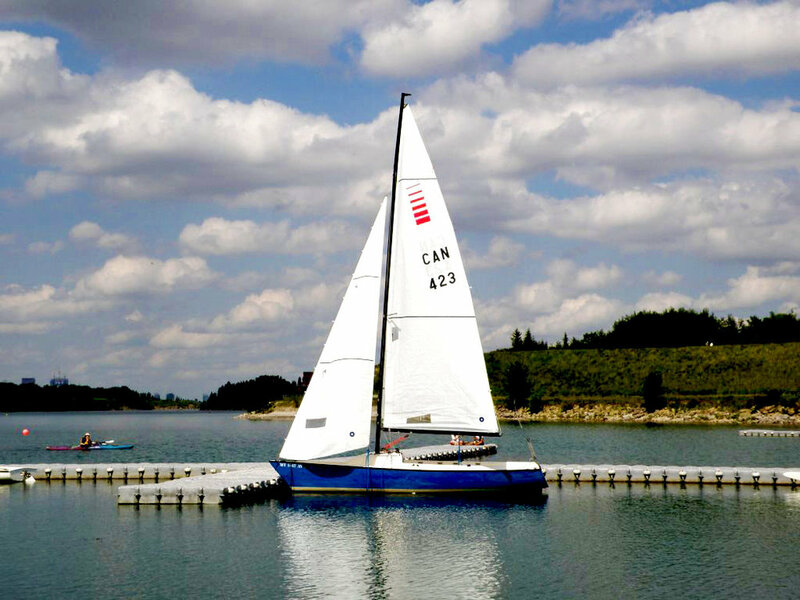 The Disabled Sailing Association of Alberta staff and volunteers are oriented and trained to provide a safe and fun experience to all users of the program. Every season, our dedicated DSA Alberta staff and volunteers contribute to the safe operation of our daily programming. Providing comprehensive orientation and training for our staff and volunteers is a key component of our focus on safety. Our program includes Volunteer Orientation days, a Staff & Volunteer Training Guide covering all aspects of our operations, qualifying Volunteers for Sailing Companion role, and providing "hands-on" training during the season. Participants in all DSA Alberta programs (members, clients of community partnership events and all volunteers) complete a Release and Assumption of Liability and a Medical Information and Release. Completed forms are secured and maintained by the staff. Information provided on the Medical Information and Release form is confidential and will only be used to assist in the event of an accident, injury or medical emergency, and to identify emergency contacts, parents or legal guardians, etc.